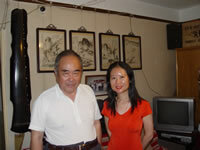 In addition to my meeting NAGA consultants Li Xiangting, Gong Yi, Wu Zhao, and Chen Changlin, I visit Professor Li Xiangting,Zheng Minzhong and Xu Jian during my trip in China Aug to Sept. 2004. These photos were taken in the places where they live. You will see our NAGA consultants' ordinary life at home. Though their places are simple, their experience of life is so rich. 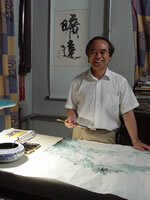 Here I am including some of Professor Li's new paintings and calligraphy, so that you can better understand the rich, deep and powerful feelings behind his music, far beyond mere technique. 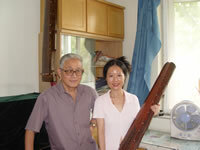 Guqin is not only a musical field, but also contains a lot Chinese culture. 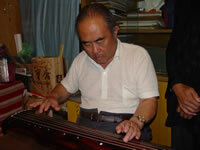 To be sure, technique is very important, but it is not all that's required to become a complete qinren(Qin player). A rich life does not just mean a luxurious life. I was told that Zheng Minzhong should count as a multi-millionaire since he own many good antique qins, yet he keeps his home and his life very simple. 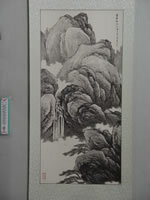 He may be a treasure in the field of guqin , but he still rides a bicycle to work in the Forbidden City Museum every day. Can you believe he is in his 80s? Yes, I can feel his rich spirituality when we talk. 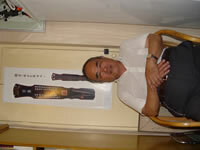 Xu Jian is also in his 80s, and he goes to swimming everyday. I still remember that 2 years ago he rode a bike to attend our online guqin concert at the People's Daily, even though I told him I could arrange a driver to pick him up. 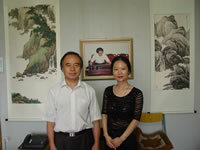 We could not find this great qin scholar at the banquet after the concert - he had cycled home with his wife. 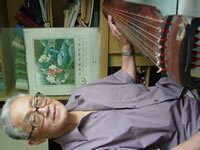 There is a saying that guqin music can make people live a long time. I think that the reason these people are so healthy in their old age is that they have a high degree of self-cultivation and a positive attitude to life. I very much enjoyed talking with them. Even when we just spoke about small and unimportant things I still learned a lot from them. When I was face to face with them I felt I was still a new student, even though I had been playing the guqin for over 20 years. I want to introduce the guqin to America and the rest of the western world: not just the music but the whole qin tradition and Chinese culture. Did you learn anything from their photos - even from just their smiles? I didn't describe too much about their personality and behavior that gave them such a high reputation and are experts in their field; I want to leave you to think about that. This is also a simple quiz to test whether or not you are suitable to play the guqin , how far you can go and how much you can gain even you don't real play and don't plan to play the guqin . 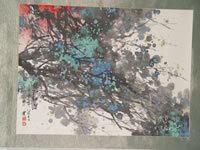 ?1999-2006 North American Guqin Association, All Rights Reserved.